For tips and advice on setting up your water fountain, watch the How to video on the support page. Find a location that is level and where you can dig a hole for the water reservoir. It is also a good idea to position the feature where you will get the most enjoyment from it, next to your patio or deck, or where you can see it from your home. You do not need a permanent water supply, the reservoir holds all the water needed and the pump circulates this to create the bubbling fountain effect. However, you will need access to a correctly installed, outdoor power supply. For guidance on setting up your water fountain kit we recommend you watch the ‘How to’ film. The water fountain kit allows you to use your own creativity and style to choose the colour, shape and finish of the pot you use. You can also complement your chosen pot with ornamental cobbles or stones. 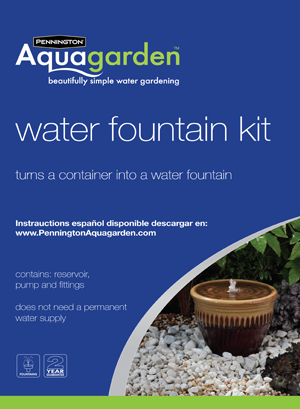 The fountain pump that comes in the kit is designed to run a small feature such as the container water fountain. It should be set to its maximum flow using the yellow flow diverter on the pump, or adjusted down to suit the desired effect. You will need to fill the reservoir completely when you first build your fountain feature. The best way is to run a hose into the pot and wait until the reservoir over-flows up into the ornamental gravel. You can fill from a watering can but this will take several cans. Once you have switched the fountain on, it is also a great idea to run some more water in, to ensure there is plenty in the system. In hot weather you will experience some evaporation, and everyday splash is very normal. It is vital that you keep your feature topped-off with water at this time. If the water level is reduced, the pump will not run correctly and will get damaged. The guarantee will not cover this damage. So, in warm weather just check the flow is as it should be each day and add enough water to the reservoir to make it over-flows, just as when you first filled the feature. Always turn off the power before maintenance. The pump motor can be permanently damaged if run dry. The Water Fountain is a very simple feature and needs little maintenance once up and running. The most important thing to remember is to keep the water topped-off. If the feature stops running, or the flow is very much reduced, firstly ensure there is enough water in the system and top it off. If this does not solve the issue then you should check the pump. First turn off the power and remove the pump from the reservoir. Following the instructions, open up the pump and check the impellor for dirt or wear. Clean off and return the pump and the parts and try running your feature again. Whenever you introduce water into an environment that is warm and has sunlight, you are likely to experience algae growth. There are many products available to deal with algal growth in your feature, see in store or online for suitable algae treatment products. If you want pets or wildlife to visit or drink from your feature take care to use animal products. Check in store for suitable pond/feature algae treatments. What size container I can use? The container should be a maximum 4 gallon capacity. The container should not exceed 21″ wide and 18″ high. How do I fit the plugs? The plugs need to be pushed in tightly from the base of the container, not from the inside of the container. You only need one free hole for the pipe connector. Plumbers tape may aid in sealing of the plugs if the container’s hole is hard to seal. A small amount of leakage from the pot holes back into the reservoir won’t affect the performance of your water fountain. A one ½ cubic foot bag is required to fill the bulk of the container and 2-3 ½ cubic foot bags or ornamental gravel to top off the container and cover the base of the reservoir. How do I adjust the pump? A flow controller is present on the pump that allows you to control the flow of the pump. There is a + that means more flow and a – that means reduced flow. What should I do if I’m going away? It is advisable to turn the pump off if you’re going away on holiday, because the pump could be damaged if it runs dry. How often should I top up the water? The flow from the fountain will reduce and bubble as the reservoir starts to run low on water; the pump may even run dry and become noisy. The reservoir should be filled up regularly to ensure permanent damage to the pump does not occur. In warmer weather topping up will be required more frequently due to increased evaporation. Can I plug the pump into a normal socket? We recommend that a GFCI (Ground Fault Circuit Interrupter) is always used for safety reasons. I am getting a very low/no flow from my pump? Ensure that the pipe is not kinked or too long and that the pump cage is clean and free from debris. My container kit does not overflow the container itself and the pump starts to struggle as there isn’t enough water in the reservoir? Ensure you fill the container with gravel; it must be at least filled to 3 inches of the rim of the container with normal gravel and then filled to an inch of the rim of the container with ornamental gravel. This ensures the inside volume of the pot is not more than the volume in the reservoir, leaving the pump able to circulate the water freely. Aquagarden products by Pennington have been designed in partnership with Interpet, a leading British water gardening company. Over half a century of fish keeping and pond knowledge are brought together in these products, so you can be assured of beautifully simple water gardening.